So many plaintiffs’ attorneys ask me if they should invest in Yellow Page advertising. My answer always depends on what the firm is trying to accomplish and what books are available in their market. 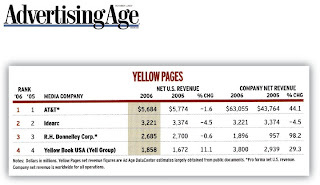 Ad Age recently reported on 2006 net U.S. revenue and growth for the top four Yellow Page companies. Check out the growth of Yellow Book USA. 11.1% growth in net revenue as compared to a loss for the other three. Nice work in a market where naysayers believe it’s the end of the printed directory. Just like the Internet didn’t do away with print newspapers (not yet anyway), printed directories aren’t going away any time soon. The bottom line: Yellow Pages need to continue to diversify into the digital markets, capitalize on Web 2.0, and keep the medium affordable for advertisers. "PR Works According to Mark Weiner"
How Does Your Credit Card Rate?